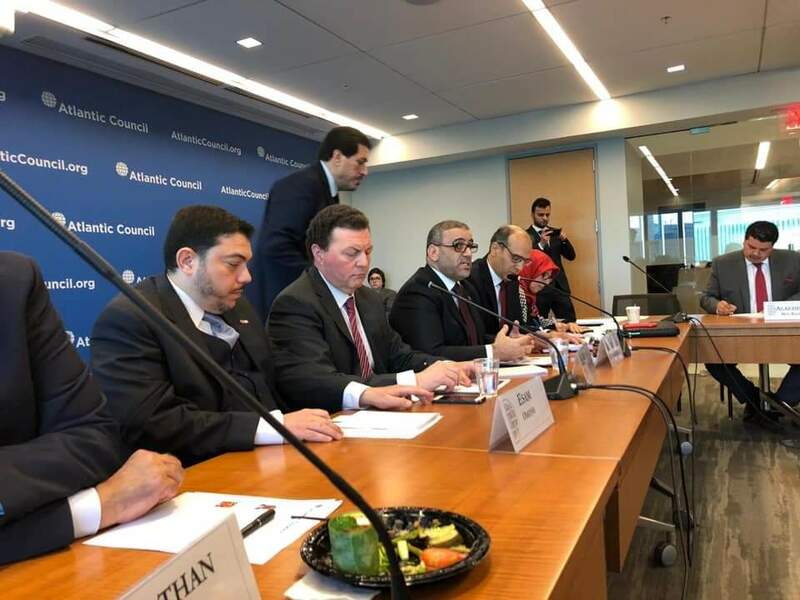 HSC head Khaled Mishri was speaking at the Atlantic Council in Washington DC yesterday as part of his drive this week to court the U S. capital (Photo: Social media). Khaled Mishri, the head of Libya’s consultative body, the High State Council, is on a public relations drive in Washington DC. Yesterday he was hosted by the leading DC think-tank, the Atlantic Council. Updating the audience on the latest political developments in Libya, Mishri stressed the need for nationwide reconciliation. He called for inclusivity in Libya’s political process – even to supporters of the former Qaddafi regime. Mishri also reached out to Khalifa Hafter supporters. On Hafter and his Libyan National Army (LNA), Mishri was quite conciliatory to his Washington audience, saying he respected the army’s anti terrorism efforts. On Hafter specifically, he said his only disagreement was that Hafter would not agree to civilian control of the LNA. On his membership of the Muslim Brotherhood, Mishri confirmed his recent sudden resignation from the organization. He stressed that he still respected the group and explained that his resignation from the it came from the desire to be freed from its limiting ideology and outlook. On external interference in Libya and it’s effect on the political situation, Mishri conceded that some countries have legitimate interests in Libya. He said that Libyans must understand this concern and must reassure those countries. Mishri highlighted the legitimate security interests of Egypt with regards to its border with Libya. Mishri is slated to speak at a number of other meetings in Washington during the week, including unconfirmed reports of a meeting with Congress. Mishri’s Atlantic Council meeting was attended by a large number of people in Washington interested in Libya, including experts, politicians and representatives of the IMF, World Bank and embassies.